Lisa Cardenas, “French Kiss,” acrylic and oil on canvas, 20 x 20"
A suite of nine medium-sized abstract paintings by Lisa Cardenas, titled "Silence Is Home,” are lovely examples of lyrical abstraction. Cardenas lives and works in Dallas, where she earned an MFA in Arts and Technology at the University of Texas at Dallas. What comes through in Cardenas' paintings is that she’s much more art than tech. The nine paintings on view share a preponderance of reds and blues. In many, strands and musical forms and lines seem to hover over dark backgrounds. 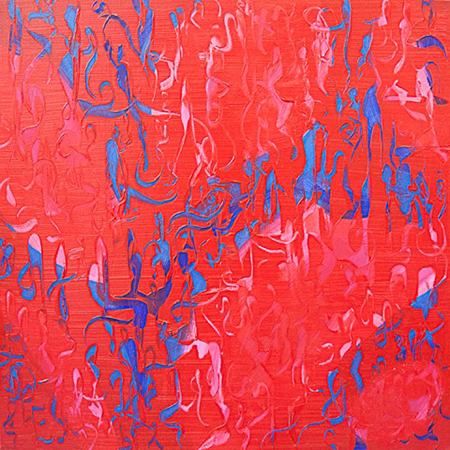 "French Kiss" and “Spellbound” feel like close-up views of swirling forms in blue over a red background, with a blue wash playing a prominent role in the second painting. These contrast wonderfully with two stunning horizontal pieces: in "Shifting Energies" the reed-like forms in red resemble columns of flames burning vertically from one end of the long span (20 by 60 inches) to the other. The flame forms jet out from a central section and reach the edges of the canvas toward the top and bottom. That central section represents the energy source for the flame-like tendrils, which Cardenas paints in an icy hot blue-white, like the flame on the tip of a blow torch. In an artist statement she remarks: “painting allows me the opportunity to see reality with a clear vision … all art is real, based upon physical dimension and limitless possibilities of current imagination.” The repetitive gestures and forms of this series do credit to the views expressed in the artist's words and the exhibition’s title. On these canvases the infinite and cosmic are expressed perceptually, flowing in and through Cardenas' abstract world.